It's the product of untold hours of labor, hailed as the key to a company's success — but it is frequently left abandoned on a bookshelf, for the most part unread. It's the marketing plan: too often wordy, unfocused, crammed with tangential information and longer than many novels. Kellogg Clinical Professor of Marketing Tim Calkins has encountered his share of these tomes. A former marketing executive, Calkins has waded through hundreds of marketing plans over the years. He recalls one example, its 259 pages stuffed with minutiae about distributors, suppliers, industry trends, regulatory changes and consumer preferences. By the time he got to the actual marketing recommendations, Calkins was overwhelmed. And it still wasn't clear to him: How would this plan work? "Well, you know, that's a pretty good question," replied the executive who had given Calkins the document to review. "Of course, you're probably the first person who has actually read the entire plan." No surprise, Calkins says: "How many executives have time to sit down and read a 259-page-single-spaced document?" he asks. "They hardly have time to flip through The Wall Street Journal." 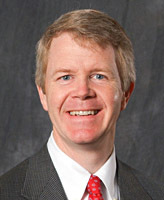 The Kellogg faculty member believes most marketing plans can be better. The ideal plan, he says, is focused, achievable, compelling and simple — and far more likely to produce results. "A good marketing plan gets you to the plate," Calkins says. "It gives you a chance to succeed." 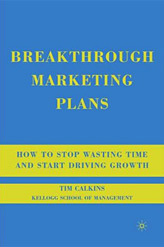 Calkins offers a step-by-step guide to creating such a plan in his new book, Breakthrough Marketing Plans: How to Stop Wasting Time and Start Driving Growth. The book is drawing raves from marketing practitioners. "Stunningly simple," says Randy Gier, chief consumer officer of Dr. Pepper Snapple Group. "A great guide for anyone who strives to have clarity and impact from their marketing strategies — from the CEO to the entry-level marketer." Calkins examines the typical marketing plan and explains why so many are, as he says, "a waste of time." The saboteurs include an overabundance of data, weak strategic thinking and a failure to support recommendations. He reviews key elements of a good marketing plan, and zeroes in on what makes one a standout. "Is this plan focused on just a few big things?" he asks. "Can we really achieve the goals? Is it presented in a compelling way? Is it simple to read and understand? "Asking these basic questions," Calkins writes, "will ensure the plan is on the right track." Calkins also goes into depth about the planning process. He offers an eight-step approach, from creating cross-functional teams to clarifying goals, analyzing the market, identifying tactics and then finally selling and executing the plan. He provides detailed advice on writing and presenting a stellar marketing plan. "Show your confidence," Calkins urges. "Senior executives need to see confidence in the presenter." That enthusiasm flows naturally from having a familiarity with the business and a firm grasp of the facts, he notes. It also comes from practicing the presentation like a veteran storyteller. Calkins offers a chapter likely to be bookmarked by under-the-gun marketing teams: a template for creating a marketing plan that sings. It is "not as simple as it looks," he says, but it "will get you moving in the right direction." Ultimately, Calkins hopes his book will be a resource both for those new to writing marketing plans, and for seasoned veterans who review them too. Available in paperback and hardcover, the text is designed to be a reference and a working tool. "The goal of this book is to be very practical and effective, and to help people write plans that are clear and supported and get great results in the market," Calkins says. It may also, as he writes in his introduction, "encourage more than a few people to deposit their current marketing plans in the recycling bin and start over."